The health benefits of malabar spinach include skin care, improving eye-sight, digestion, immunity system, sleep, strengthening bones and teeth, preventing heart attacks, cancer, anemia, dementia, urinary-tract infections and ensuring healthy development of foetus during pregnancy. 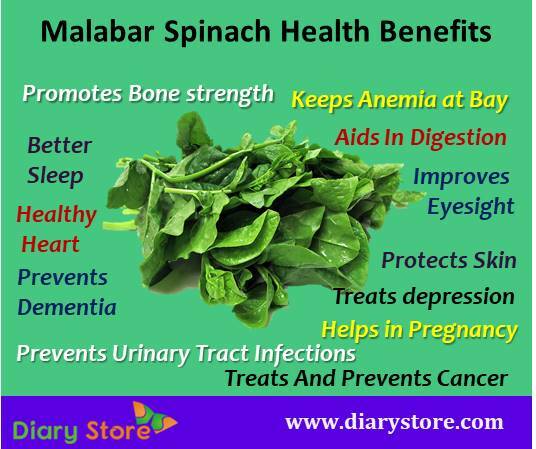 Malabar spinach is a green leafy vegetable. It belongs to the Basellaceae family and the botanical name of malabar spinach is Basella Alba. It is not related to spinach. It has fleshy, juicy leaves and tastes like citrus and pepper, when it is raw. When cooked it tastes like spinach. Malabar spinach is native to the Southeast Asia, New Guinea and Indian Subcontinent. The various common names of malabar spinach are vine spinach, red vine spinach, creeping spinach, climbing spinach, Ceylon spinach, buffalo spinach and basella alba. According to the University of Florida, malabar spinach is also referred to as acelga, trepadora, bretana, libato, gui, basella and malabar nightshade. 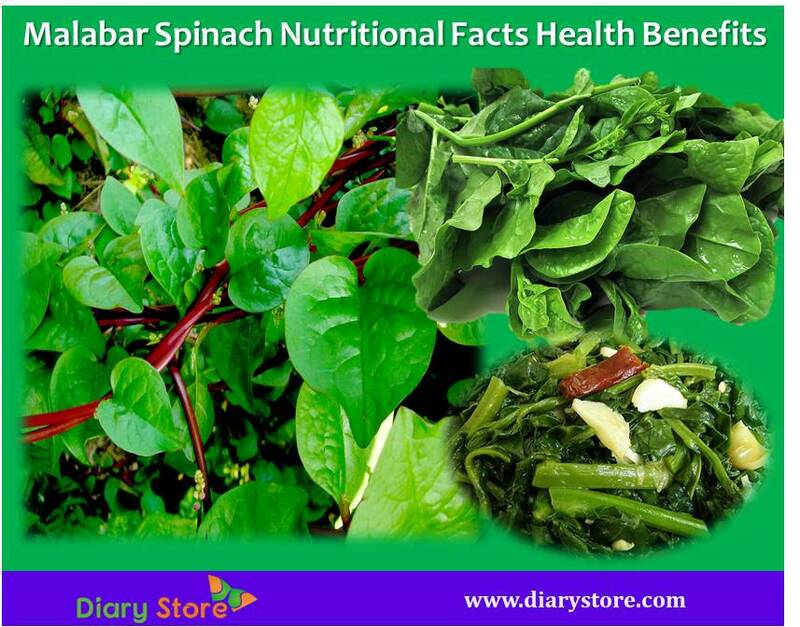 There are two types of malabar spinach; Basella alba and Basella rubra. Basella alba has dark green leaves and green stem while Basella rubra has deep green leaves with pink veins and purplish stems. It is widely used as a leafy vegetable and it is grown under the sunlight and humid climates. Malabar spinach is used to make thick soups, stir fries and chili peppers. These are low in calories and rich in proteins. Free radicals are known to cause damage at the roots of cells in tissues of eye retina. The anti-oxidants like vitamins A and C, beta-carotene, zeaxanthin and lutein present in Malabar spinach protect eyes from free radicals. The fiber present in basella provides roughage helpful in proper digestion which in turn helps in good assimilation of nutrients and protects from the risk of colorectal cancer by detoxification. Calcium and magnesium are both necessary for bone strength. While calcium is required for strong bones, magnesium is necessary for proper absorption of calcium in the body. Since calcium and magnesium are found to be among the ingredients of Malabar spinach it gives bones the required strength. The high intake of folates through Malabar spinach helps in treating depression. Certain amino acids from proteins supplied by basella can control mood and anxiety levels. One of the reasons for occurrence of cancer is low presence of folates in the body. The deficiency of folates in the body is compensated by Malabar spinach preventing the growth of cancer. Dullness of mind, dementia, Alzheimer’s disease are caused by high levels of homocysteine and low quantity of folates in the body. Malabar spinach with good presence of folates can reduce the effects of homocysteine and help in lifting up poor mental activity and preventing Alzheimer’s disease. Malabar spinach supplies sufficient quantities of magnesium, a mineral which is necessary to relax the stressed muscles due to lack of sleep. When the muscles undergo relaxation, the body sinks into comfortable sleep. For a foetus to grow properly in its mother’s womb, the good healthy condition of neural tube is crucial. The folate which is a B-complex vitamin nurtures the embryo, more particularly its neural tube, promoting the proper growth of foetus during pregnancy. Pregnant mothers who make the leafy vegetable as a compulsory item in their regular diet are found to have normal formation of placenta and give birth to healthy infants. Consumption of Malabar spinach, especially in salad or raw form, is found to have a good preventive and remedial effect in urinary tract infection and reduces the burning sensation during urination. Basella leaves contain appreciable quantities of minerals like potassium, manganese, calcium, magnesium and copper. Human body mainly requires potassium for proper function and efficient circulatory system. Potassium nullifies the minor repercussions of intake of salt and brings down blood pressure to normal levels. Deficiency in folates causes anemia which features inadequate presence of red blood corpuscles. Basella leaves rich in folates help in absorption of vitamin B 12 and iron to cure anemia and keep the body energetic and healthy. Antioxidants like zeaxanthin, lutein, beta carotene, vitamins A and C present in Malabar spinach leaves offer good protection from free radicals which can damage skin and bring in premature ageing.